We have monitored the official Twitter account of the Festival during the four days of the event with the objective of showing the potential of Tapoi monitoring functionality and presenting some valuable information about the Festival. The Trento Economics Festival is an event born in 2006 from the idea of creating an environment in which worldwide known economists can talk to and discuss with a general public, translating their language to make it comprehensible to everyone. The Festival is held on an annual base in Trento. The twelfth edition took place this year, from the 1st to the 4th of June 2017, having the “Health Gap” as theme and topic of the discussion. The manifestation has involved 2 Nobel Prize winners, 2 Italian Government ministers and a panel of experts from the most prestigious universities in the world for a total of 189 speakers and 50 moderators who have animated 102 events. We have monitored the official Twitter account of the Festival – @economicsfest – during the four days of the event with the objective of showing the potential of Tapoi monitoring features and presenting some valuable information about the Festival. Our choice of the Economics Festival was not random: the operational headquarter of our company is also based in Trento. Tapoi analysis shows a massive activity of the account, with 332 tweets in four days, 260 mentioned hashtags (196 unique ones) and 557 mentioned accounts (132 unique ones). These activities have allowed the page to gain 190 new followers moving the counter from 6423 to 6613. The analysis of the tweets reveals those that are the most used hashtags and mentions and how many times they have been used. Despite the previous data being an indicator of the magnitude of the Festival, the most interesting aspects arise from a more sophisticated analysis: the semantic one. Tapoi can identify and extract the most meaningful words (we call them entities) used in the shared texts and organize them them by topic. During the four days we monitored the Twitter account we were able to collect 823 distinct entities and 3030 unique topics. This kind of analysis presents an immediate and easy-to-read picture of what were the key discussion arguments of the event. The word cloud below highlights some of the most relevant entities and topics. Indeed, it is possible to identify most of them as belonging to the Health domain, which has been the main focus of the Festival. An interesting fact: the relevance of the word “Youtube” is unmistakable and reflects the high number of videos shared during the event. The entities and the topics collected during the semantic analysis are key for modelling and profiling the account. We have built some categories for identifying those vertical domains that were discussed by the Festival account. 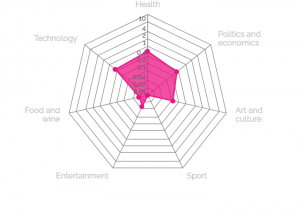 As you can see in the spider chart below, Tapoi confirms how the social discussion was mainly focused on the vertical categories health, politics and economics and technology while others, such as the sport one, were completely ignored. This article demonstrates Tapoi effectiveness in monitoring a Twitter account. 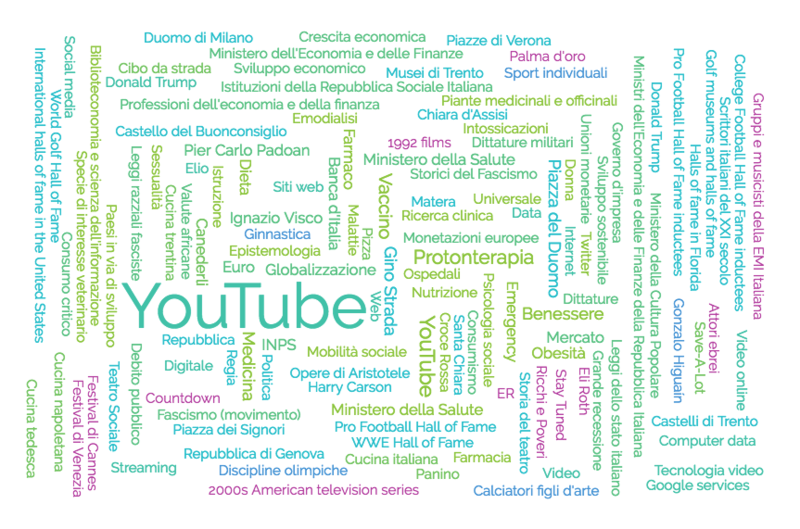 Taking into consideration the account of the Trento Economics Festival during the four days of the 2017 edition, we have managed to identify the main vertical domains discussed and found a pretty good match with the reality. In fact, the results show that the topics dealt with are mainly related to the political and economic spheres, with a strong propensity for the theme of health, which was the main focus of festival. In the meantime, also the 2018th edition of the Festival has taken place: all the results of our analysis together with the comparison with the 2017th edition are available in Monitoring the Trento Economics Festival 2018. In order to see some updated and live data of the Festival account, visit our monitoring page of the Trento Economics Festival. This is just an example of how Tapoi monitoring can be applied to study the social coverage of an event. Imagine how the same approach could be applied to monitor the social activities of a competitor company or to identify a group of influencers for driving the advertising campaign of a specific brand. Previous Post Previous Post Can Tapoi really predict your interests?